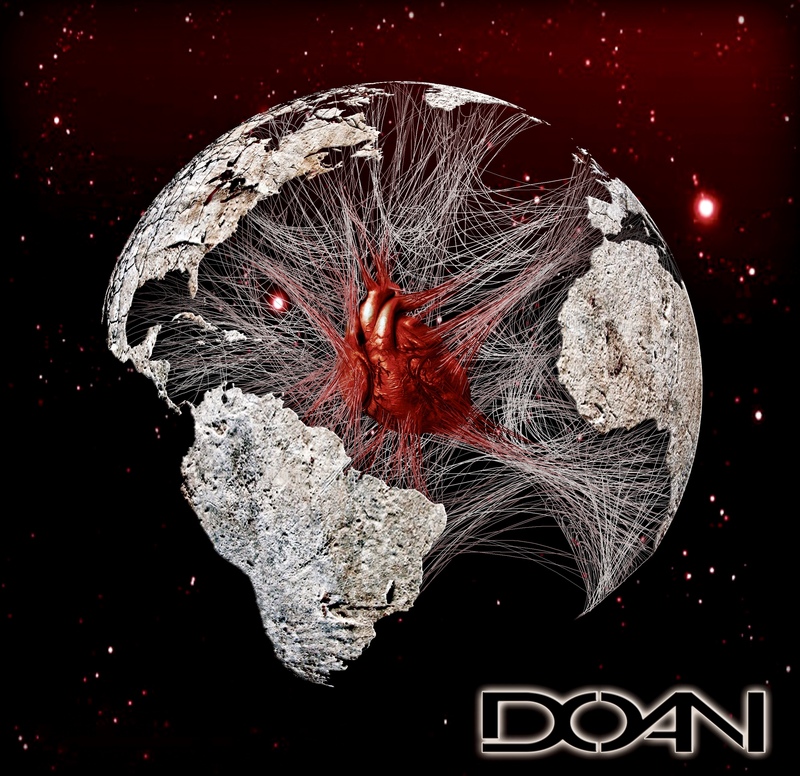 Prog alt metal, from Québec, Canada, DOAN was formed in 2011, originally as a covers band, then known as ‘Ghettoblaster’. Adopting a new moniker in 2017, they then began focusing on original material. Blending heaviness with melody, they’re inspired by Tool, AIC, Mastodon, A Perfect Circle, Deftones, Godsmack, etc. ‘Stupidity Kills’ is their self produced debut album. Some Kind Of – Instant, explosive intro. Spoken word section embroiled in the instrumentals, in an Axl Rose/Alice Cooper style. Lots of heavy bass involvement. Very melodic, with a thought-provoking angle and a well polished production and performance. Slight sci-fi sound, enhanced by the black background and images within the cover art. It’s certainly fresh and edgy, if more concept than catchy. Undeniably unique and very proggy. Wrong Number – Tribal drum beats intro, followed closely by a heavy, thrumming bass and a rumbling drum sound, like a warning of impending mystery. The vocals kick in then, with an ominous tone, followed by edgy acute riffage. A space rock feeling encapsulates this and it continues on with more drumming and high-end riffs, till it ends on another screechy, sharpened riff. Stepback – Earthy drumming intro’s, blended with riffs, stepping forward and becoming more prominent, joined by the vocal passion. Now a psychedelic element enters the equation, bringing a dreamy feel to the track. A floaty sense creeps in and the sudden energy appearing briefly within that riffage is actually quite BERDOO-esque. Reverting back to a patchy stop start formula, the rest is slightly samey, but always melodic and its sound production never lets it down. The Sheeps – Creepy, sinister riff and bass intro, adding a powerful immediacy. This is where it really gets into its stride. A more natural flow. Easily audible, this new confidence lends it strength. Again, a few BERDOO-esque riffs return, adding an ease and accomplished quality. More melodic rhythm and plenty of cohesion, as the vocals blend into the accompaniments. Madness Of Reason – Good, confident drum intro and a faster rhythm, with a heavier riff. The vocals echo and the pace increases, as instrumental chaos ensues, with a cacophony of sound. The natural flow resumes and again, it’s a bit repetitive, however well conveyed. A bit of variation would serve it well. We Belong To – Nice neat riffage opening, quite charming, in its own way, making the most of its smaller, more intently focused sound. In places, there’s a slight 4 Non-Blondes sound to those vocals. Becoming more electrified, sporadically, once more, those BERDOO-esque riffs enter the track, lifting it up and creating a higher energy to the song’s atmosphere. Ending the track with those same riffs, a whole new essence floods the outro. A pure instrumental of those riffs alone would do the album a lot of justice. False Reality – Introing on a nifty click of the drum sticks and a few cymbal hits, this time, an ease enters the vocals, bringing a whole different style and flavour to the accompaniments. It all just flows easier here. It’s one of those moments when the site of genuine passion and belief becomes clear. A quicker pace and rhythm infiltrates this, serving it well, throughout. There’s just a jazzier, livelier beat to this altogether. Happy Sobriety – Bass introing, carefully and tentatively and the cymbals are hit in the same cautious way, before it opens up and blasts into life. An effective touch. That slight psychedelic tone enters again, adding colour and light. Once more, it ends on one of those shiny, BERDOO-esque riffs, making it instantly more memorable. Good sound values and a lighter feel to this one. The Sames – Opening far more ominously, with a stretched elasticity to the riffs, bringing it into a completely new territory. Injecting an old school bluesy, lounge tone to those vocals, it works, evoking Woodstock-esque imagery. Yet again, there’s just something so BERDOO-esque about those closing riffs, that the mood becomes so much more vibrant, as soon as you hear them. Still, the song itself is very trippy and colour vision inducing, combining psych with alt, prog, space and early blues. A good combo, creating imaginative capacity. Overall – ‘Stupidity Kills’ is an unusual sound, creating space for your imagination to fill in the blanks. Well produced and well performed, all it needs is a moderate injection of variety, to fulfil its greater potential. The guitar riffs are its standout feature and therefore, its USP. For fans of Purson, Hawkwind, Dread and Defeater.